Night is falling in Florida at the Orlando International Airport. Back home, it is a quiet Sunday evening. My kids sit quietly; reading or playing video games (the 1st time in 2 weeks he’s done that!) My hubby reads on the computer. I am annoyed by the lady beside me, talking so loudly onto her cell phone; telling her kids over and over that she loves them and will see them soon. I breathe; I am ashamed at my annoyance since it’s obvious she really misses them while mine sit 2 feet away. I scribble on a small pad of hotel paper, in between finishing the inspiring pages of “Bird by Bird“. 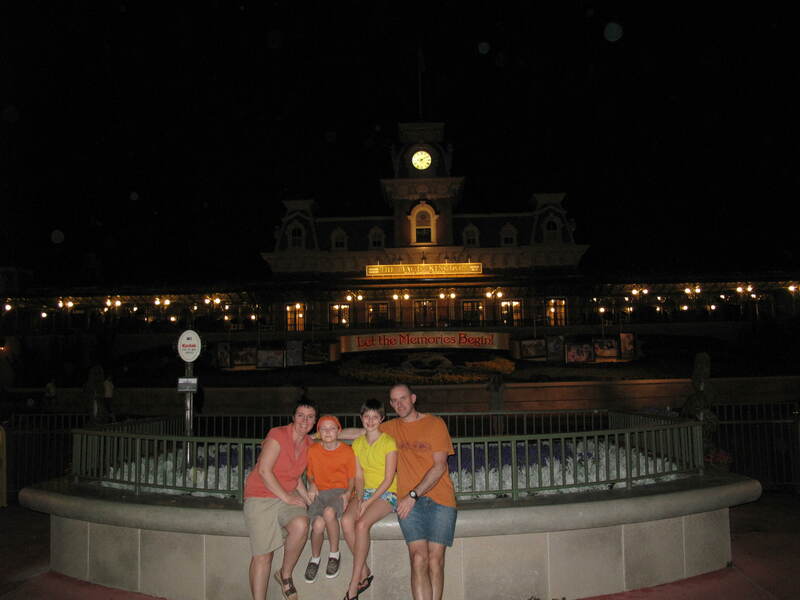 Another family nearby is still wound up from the days of excitement in the Magic Kingdom. Walt was on to something when he created places like this. He didn’t do it for the money, I truly believe that. He must have done it for so much more than that. For the Dreams: The sparkle of life in the tired mom who thought she’d given up on crazy dreams. She is a little girl again. A princess. A fairy. A Pocahontas. In awe as the fireworks flash and crash. Dreaming of possibilities. Dreaming of the stars. That anything, really, REALLY is possible if you dare to dream. For the Family: The dad that worries about not being good enough. Feeling lost and overwhelmed sometimes. Feeling like he’s let everyone down. He is alive again as he splashes and plays and explores new worlds with his children. The children who see him as the hero. Their very own Hercules. He even dares to see it too. For the Kids: So sucked into the modern life of television, screens and Internet. Seemingly lacking in imagination and day dreams. Now, patient and ecstatic, little Energizer bunnies going mile after mile, entranced and enthralled with the world around them. Thrills and spills as they chance riding rockets to the sky. In the spirit of the moment, exploring Flick’s bug world or on Safari across Africa or soaring through the sky. Fully immersed in the day. Walt was a visionary to see how much we would need places like this. Places to fill up again. To get in touch with ourselves. To see through a child’s eyes again – even kids don’t know how to do that anymore. We go so fast and forget to be there, in the moment. Walt’s World reminds us how quickly life will pass you by if you don’t slow down once in awhile and take it all in. Daring to dream, daring to be a hero or daring to have a little fun and get lost in the moment. I begin again, with a renewed spirit, paying closer attention to the Colors of the Wind. Thank you Walt. Thank you my family for making this the best vacation ever! I love this. You are such a great mom; my version of Disney is much more…vinegary?…than yours. Love that you caught the spirit of it. ps: Bird by Bird rocks. Shawna, when we were in Disneyland my souvenir for myself was two books about Walt Disney! He was indeed an inspired mind! And the parks? Disneyland came to life because he went to take his daughters to an amusement park, and was disgusted at the garbage and the condition of the place, and why you would have to pay for each individual ride… he wondered why there wasn’t a place that was clean, and had entertainment for the whole family, and could challenge children to learn and dream and experience life to its fullest — all for one price at one gate. People told him it wouldn’t work. They thought he was nuts. ….when we hear those words, we know we are on the right track. We know we are thinking like Walt.